I was diagnosed with multiple myeloma in 2008. For a year, I was in the “watch and wait” category with no treatment until the disease progressed. In April 2009 I progressed to “active disease” and began treatments followed by an autologous stem cell transplant in January 2010. During this entire time, I was able to work as a PT who specialized in treating people with cancer. Because of my diagnosis with cancer I was able to bring a special kind of understanding to my patients with cancer. Most importantly, I was able to bring them hope by their seeing me work while undergoing treatment. I relapsed in 2012, but continued working until my retirement in 2013. During the time before and since my retirement I have travelled extensively in the U.S. and throughout Europe. I credit the new treatment regimens for myeloma in keeping me well enough to continue enjoying all aspects of my life. Unfortunately, 2016 wasn’t a good year for me. I relapsed with the myeloma again and was diagnosed with acute lymphoblastic leukemia (ALL). But with excellent medical care from my oncology team, I’m in remission and in another successful treatment regimen. I am gradually returning to my life of volunteering and patient advocacy. 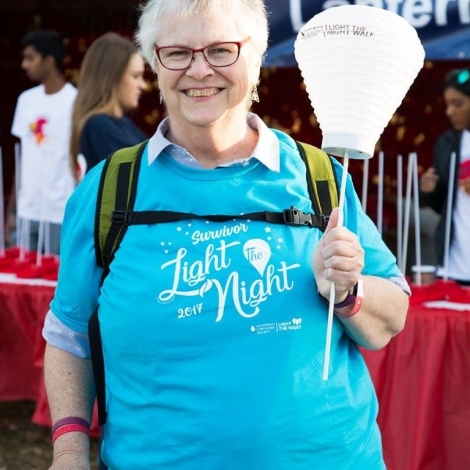 A highlight of 2017 was my participation in LLS’s Light The Night Walk in Philadelphia. It was inspirational looking out at all of the lit lanterns and to know how many people support those of us with blood cancers.